The physical act of smoking isn’t really that cool these days...but smoking as an idea, especially in music, lives in a romantic, seductive world free of coughing and secondhand smoke. k.d. lang pays tribute to the idea with an album of covers centering on the motif of smoking. Songs such as Steve Miller’s “Joker” and The Hollies’ “The Air That I Breathe,” are cast in a blue smoky tinge with lang’s voice elevating the subject matter. A Peter Gabriel cover album? Cool! David Bowie, Lou Reed, Randy Newman, Arcade Fire, Neil Young, Regina Spektor...a bit of everything. But it’s not just a cover album. Billed as a “music exchange,” Gabriel has arranged for the artists to cover his songs on a future album called I’ll Scratch Yours. Perhaps Lou Reed doing “In Your Eyes?” And Bowie doing “Solsbury Hill?” Where do we sign? You wouldn’t expect the author of a noir-crime novel (A Simple Plan) to follow up a 13-year hiatus with a horror novel. But Scott Smith did and who’s complaining? The Ruins takes the “man vs. wild” theme and turns it up with a terrifying ordeal deep in the South American jungle. There’s not a lot to the story itself, but like any good horror story – it’s all in the telling. Keep your light on for this one, folks. 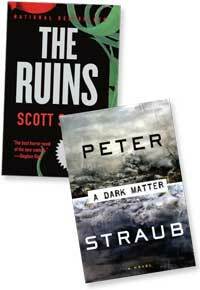 Peter Straub (Ghost Story, Mystery, In The Night Room) is one of the true masters of horror/suspense. His new novel follows a journalist revisiting a ‘60s teen occult ritual gone awry, and in Rashomon fashion, Straub explores four versions of that fateful night to uncover...murder? Or delusion? Straub flexes his storytelling muscle with this new release, building tension in a way that guarantees a good read for all fans. Written and directed by Japanese legend Hayao Miyazaki, Spirited Away is the perfect mix of dreamlike fairytale and dramatic emotion. 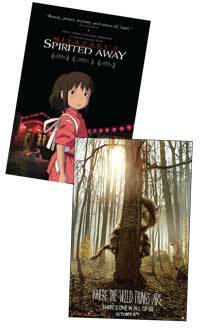 So gorgeously animated that it will transport young and old viewers alike into Chihiro’s magical world. Plan on many repeat viewings. Wild Max gets big boy pants! Spike Jonze and author Dave Eggers put their heads together and with a little alchemy, some love, and a whole lot of life-sized monsters, bring Maurice Sendak’s beloved picture book to life. Featuring Catherine Keener, Forest Whitaker, James Gandolfini, the Jim Henson Creature Shop, and talented newcomer Max Records as, well, Max!